The first free, open, online platform for courses from multiple UK universities and other leading higher education institutions has announced a further five partners today (3 May), including Loughborough University and the British Museum. Loughborough and the British Museum join Strathclyde and Glasgow universities, alongside 17 other universities, the British Council and British Library, as part of Futurelearn, with each committing to providing engaging and entertaining courses when the site launches. Loughborough will offer courses in mathematics, enterprise and innovation – areas in which the University already has a well-established reputation for excellence. Futurelearn was founded in December 2012 and now has 24 partners including those announced today. Every so often, my colleague Martin Hamilton (Head of Internet Services) and I are asked by a University group to look again at the University’s policy on the use of Web 2.0 services to support Teaching and Learning. “Web 2.0” is an unsatisfactory term that covers a wide variety of tools out there on the Web, including the best known social media services (Facebook; Twitter; LinkedIn; etc) but also an ever-increasing range of ‘other’ Web tools, some of which have been developed specifically for education but most of which have not. The Tools for Teaching section of this blog covers some of them; this section will be expanded over the next few weeks. They are characterised by the ability for a user to create a new account within moments, although of course many now adopt a ‘freemium’ business model, where users can upgrade to a paid-for account to get additional features. Many of these services also have a corresponding app for mobile devices. A cursory glance through previous posts on this blog will reveal that we have effectively been encouraging academic colleagues to exploit specific tools (Twitter and Socrative are recent examples) but do the benefits of using non-University services outweigh the risks? There certainly are risks, connected with data protection issues, the lack of service level agreement, the possibility of a service you’ve invested time in disappearing overnight, and so on. On the other hand, these services offer opportunities to engage learners in new ways, supplementing the features of central IT systems such as Learn (Moodle). Martin and I have drafted a discussion document which he has posted on his blog to elicit comments from colleagues here and elsewhere. Let us know what you think. Enhancing the quality of learning and teaching is consolidated as are meeting student expectations and improving access to learning for students off campus. Availability of TEL support staff remains the leading factor in encouraging the development of TEL, followed by central university and school/departmental senior management support, which have overtaken availability and access to tools in the rankings. Academic staff knowledge has dropped to fifth in the list of barriers influencing TEL development. However, the top two barriers to TEL development remain lack of time and money. Institutional strategies continue to influence TEL development, with teaching, learning and assessment the leading internal strategy. The key change since 2010 has been the emergence of corporate strategies, which have overtaken library and learning resources as the second most commonly cited internal strategy influencing TEL. Dedicated e-learning strategies are on the decline. Blackboard Learn is still the most common VLE, but Moodle has increased as an enterprise solution and remains the most used VLE when departmental implementations are included. Adoption of other VLEs is negligible. Plagiarism detection, e-submission, and e-assessment tools remain the most common centrally supported software in use across the sector. E-portfolio, wiki and blog tools are also well established but support for podcasting tools has declined since the 2010 Survey. Social networking, blog and document sharing tools are the most common non-centrally supported tools in use across Pre- and Post-92 institutions. The proportion of web supplemented modules has steadily decreased with web dependent modules increasing. 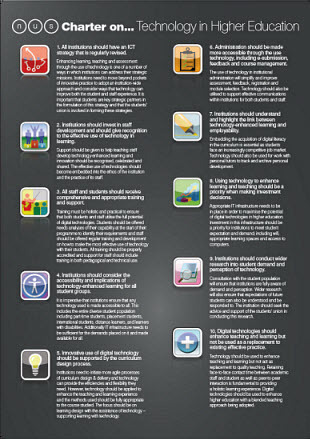 This suggests that progress has been made in embedding TEL as a key element of course delivery. However, fully online courses have decreased. There has progress towards the optimisation of services for mobile devices. Mobile technologies have moved to the top of the list of the items making the most demand on TEL support teams. E-assessment and lecture capture remain in the list of top five demands. This message has just been posted to the JISC Announce mailing list by Martyn Harrow, the new Chief Executive, and marks the end of an era for JISC, at least in terms of the way funding is distributed. Below you will find one funding call, which represents the end of our funding programme for the 2011-2012 academic year. Given the significant changes now being geared up for JISC, I thought you would appreciate it if I set these final calls in context. In the Wilson Review of JISC published in February 2011, our customers, communities and funders expressed their views very clearly about the kind of reshaped and impactful JISC they wanted us to become. Following that a Transition Group was set up with senior representatives from across the sectors we serve to produce a more developed blueprint for this new JISC. I started as Executive Secretary on 1st February; and since that time we have been working very hard to mobilise all the necessary actions to make this transition to a ‘new JISC for new times’ happen in practice. This new JISC will have a more focused mandate, will be driven by the needs of those we serve and will work within a significantly tighter funding envelope. Among many other things, therefore, it will require a new ‘business/funding model’. Proposals for which, based on the recommendations accepted from the Wilson Review and Transition Group report, are being prepared for approval. Once finalised and agreed, I expect this to commence in the financial year 2013/14. So a lot of work is in hand. The Invitation to Tender (ITT) below is therefore the last that will be undertaken in quite this way; and seeks to tie off existing commitments elegantly and obtain best value from the remaining funds allocated to JISC this year. For 2012/13 and beyond, it is my intention that increasingly the priorities for all JISC activity, including the allocation of any funds which can be made available for ‘pathfinding’ activity, will be arrived at in consultation with our customers, owners and funders – and agreed with our Board – in a more transparent and ‘co-invented’ process. I hope the above is helpful. If I can provide any further information or clarification on these points specifically, please feel free to contact me at m.harrow@jisc.ac.uk. Otherwise, the contact details for the ITT are referenced below. JISC, the UK’s leading expert on the information and digital technologies for education and research invites tenders for work as part of its Learning and Teaching Portfolio. Coursedata demonstrators: The projects will demonstrate the value to both institutions and students of aggregated, standardised course data using the xcri-cap 1.2 feeds produced by the JISC #coursedata programme. The aim is to provide compelling examples of how standardised course advertising data can be used to improve recruitment, retention and the student experience. Please click this link for further information http://www.jisc.ac.uk/fundingopportunities.aspx . Thanks to all those (30+) colleagues who attended the first Loughborough E-learning Network meeting this afternoon, chaired by Professor Ray Dawson. 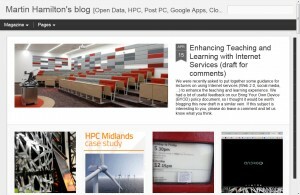 The theme was the planned migration of Learn to the next version of Moodle (V2). Rich Goodman, Manager of the E-learning Systems Team in IT Services, gave a demonstration of our test installation and answered questions relating to the changes. Notable new features of Moodle 2 include the facility to schedule the release of resources within a module page, and to make the release conditonal on successfully completing an activity. We expect that module tutors will find this both useful and convenient (because it is easier than having to remember to ‘unhide’ a resource in, say, week 5). The E-learning Network will meet regularly (probably quarterly) and will be an opportunity for staff who belong to the new school e-learning groups to come together in a wider forum. It was particularly heartening to have a good turnout for this meeting after the overwhelming success of the annual E-learning Showcase which took place on Feb 1st, with an attendance of over 100 staff from across the institution. Many of these staff were drawn (in part!) by the chance to enter a prize draw for a Kindle E-book reader. The lucky winner was Dr John Samson from Physics, pictured here (on the right) receiving his Kindle from yours truly. 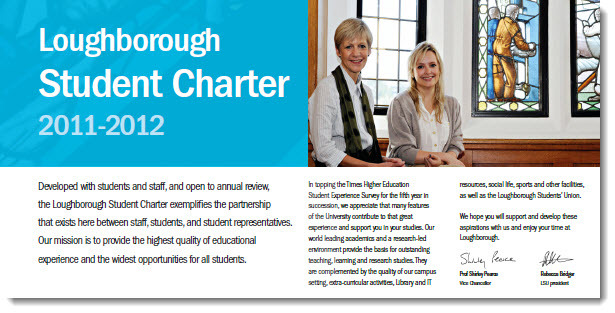 The Loughborough Student Charter, 2011-2012, was created earlier this year with the input of staff, students and student representatives from across campus. Signed by both Prof Shirley Pearce, the Vice Chancellor, and Rebecca Bridger, the Loughborough Students’ Union President, this document exemplifies the sense of partnership that exists here at Loughborough University. In addition to being available in leaflet and poster form, it is also now located at www.lboro.ac.uk/studentcharter. Developed with Loughborough Students’ Union, this document will be reviewed annually by the University’s Learning and Teaching Committee. It is based upon the work of the Student Charter Group, which was chaired by the National Union of Students and Universities UK, with Department of Business, Innovation & Skills support. Currently in a dissemination phase, it will be evaluated during the course of this academic year, before being reviewed ahead of 2012-13. Feedback to either Dr Maurice FitzGerald (Quality Enhancement Officer, Teaching Centre) – email m.fitzgerald@lboro.ac.uk – or to Jayde Savage, Vice President (Education), Loughborough Students’ Union – email vpeducation@lufbra.net – is very welcome. 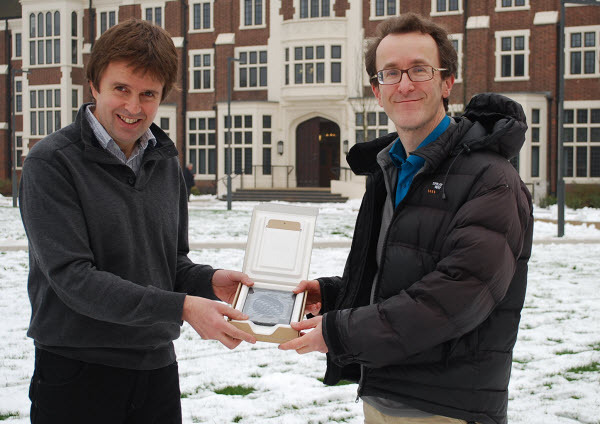 This resource was funded through the Loughborough University Development Trust. The trust exists to support the University in giving students an outstanding quality of educational experience. It raises funds from former students and other friends of the University. Their generosity has made this support possible. The NUS have produced a new Charter on Technology in Higher Education which follows on from their report into student perspectives on the use of ICT commissioned by the HEFCE Online Learning Taskforce (see previous post). The Charter was presented by Emily-Ann Nash from the NUS at the Future of Technology in Education 2011 conference at University of London Senate House last Friday. To my mind, the 10 principles set out in the Charter are uncontroversial although implementing them in full may not be straightforward. Having worked with various colleagues over the last few months developing a new E-learning Strategy for Loughborough, it is interesting to me that the 10 principles in the Charter map well onto our own document. 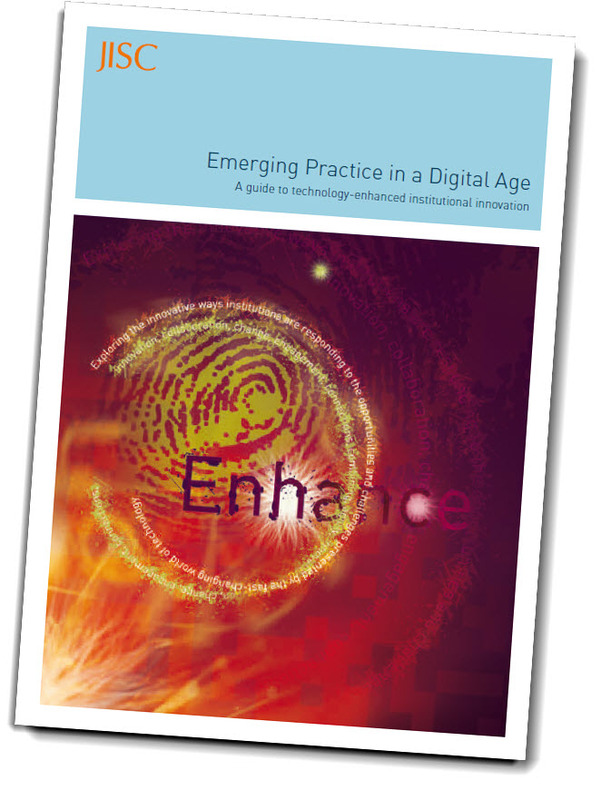 JISC have just launched at ALT-C 2011 their latest e-learning guide entitled Emerging Practice in a Digital Age: A guide to technology-enhanced institutional innovation . The report, with 10 case-studies from across UK HE, can be found at http://www.jisc.ac.uk/digiemerge . Required reading for anyone involved in e-learning in UK HE. Even in a ‘cold and challenging climate’ (as per the title of this year’s ALT-C conference in Leeds, this principle is as true as it has ever been.